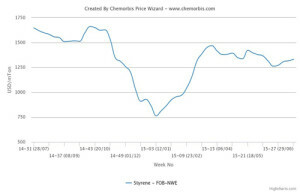 Spot styrene prices gained ground in Europe after fluctuating since the beginning of July, according to ChemOrbis. Prior to the recent gains in spot styrene prices, players were projecting decreases for the upcoming monomer contracts. However, firmer spot prices might defy those bearish expectations if this upward momentum proves to be sustainable in the days ahead. 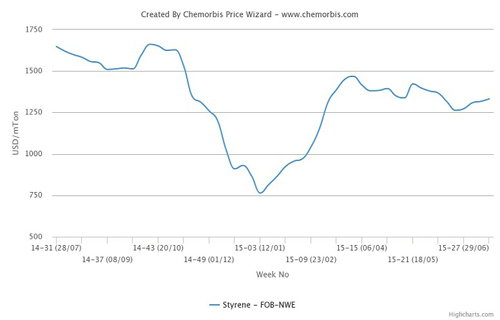 Spot prices for styrene climbed by around $30/ton on an FOB NWE basis at the end of last week. Higher spot levels were attributed to better demand from the downstream PS and ABS markets rather than an upward movement in energy costs which registered some decreases over the past couple of days. In addition, spot benzene prices also edged up on a weekly basis. Even though buyers in the downstream markets are not securing large volumes for now due to the upcoming summer holidays in August, demand has relatively been better compared to the same period of last year as most players avoided building stocks in the first half of 2015. For August, several players across Europe voiced their expectations of seeing decreases from €50/ton to €80-90/ton on PS prices similar to the trend observed this month as per ChemOrbis pricing service. However, the recent gains in the spot styrene market might contain these bearish expectations to some extent unless the market fluctuates again ahead of the new month.